First of all, to understand the new view on marketing, you need to understand your true purpose. Make sure everyone in your organization agrees on your core purpose. Without this shared understanding, you won’t be able to communicate a consistent message to your organization’s community. The purpose may be formulated in a mission or vision statement, or, at a lower level, a set of organizational objectives. But, more than that, it must be evident in all “marketing communication.” This means much more than printing the mission statement in annual reports and other publicity. It means living the core purpose in every interaction with a customer or a stakeholder. That’s why it’s so important that all staff (paid or voluntary) share, understand, and commit to the purpose. The core purpose needs to inform all press releases, meeting communications, and, most of all, the nature and quality of the services your organization delivers. Next, you need to develop your understanding of the customers and communities your organization serves. You need to build relationships with individual stakeholders and with key representatives of stakeholder groups. Unpack your concept of the “customer.” Instead, emphasize the citizens and communities your organization touches. In some settings (such as charity shops), the customer concept is relevant, but even then you must also encourage a larger view. Expand your marketing vision to include the entire community of people represented by those customers, as that is essential to develop the new view on marketing. Develop relationships with all stakeholders, including funding bodies, users of your services, the wider community in which you operate, political figures, auditors, and others. Working with stakeholders and listening to their feedback is the best way to fulfill your core purpose and develop a set of core competencies. As environments and communities change, you will be able to deploy these competencies in different contexts without losing sight of your core purpose. Third step to establish the new view on marketing: introduce your organization to your stakeholders. During this stage, you need to communicate your organization’s strengths to your stakeholders. You may wish to use such methods as mailings, visiting days, special events, special offers, or a presence on the Internet to make the first contact. Then you’ll need to persuade stakeholders to renew their contact with your organization. Now it’s time for you and your stakeholders to become better acquainted. Personal contacts, preferably at many levels and between a number of individuals, are important during this stage of the process. Understanding, knowledge, and trust need to develop. Be sure stakeholders are satisfied with the service quality, and encourage them to extend their range of involvement with the organization so that the relationship becomes more multi-dimensional. During this stage of implementing the new view on marketing, the two-way relationship is well established. The stakeholders and organization know what to expect of each other and understand their role in the relationship. For this period to be extended, the relationship must adapt to changes in either party. Both the organization and stakeholders are subject to shifting environments, and what they require from the relationship may change. If the relationship was well established in the earlier stages, both parties will have mutual investment and loyalty and will strive to manage instabilities. door open for other relationships in due course. 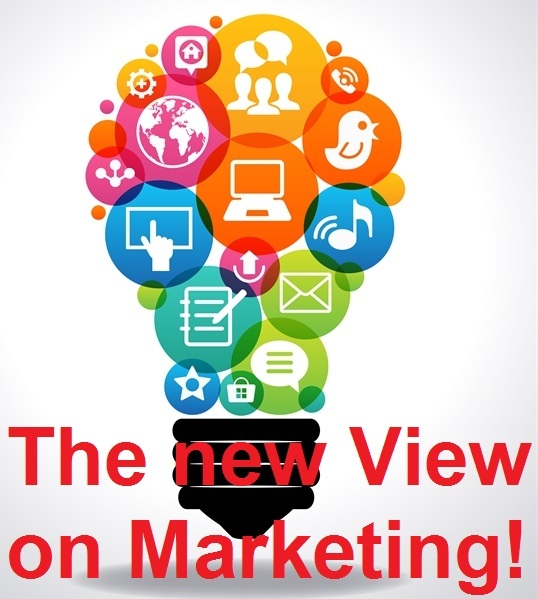 These six ingredients should lead you to the new view on marketing. We think that it is time to put aside traditional marketing ideas and reinvent marketing – with a new view on Marketing to spread your message.